Who doesn’t love a good Christmas story? One of our traditions is to read wonderful Christmas books for kids. 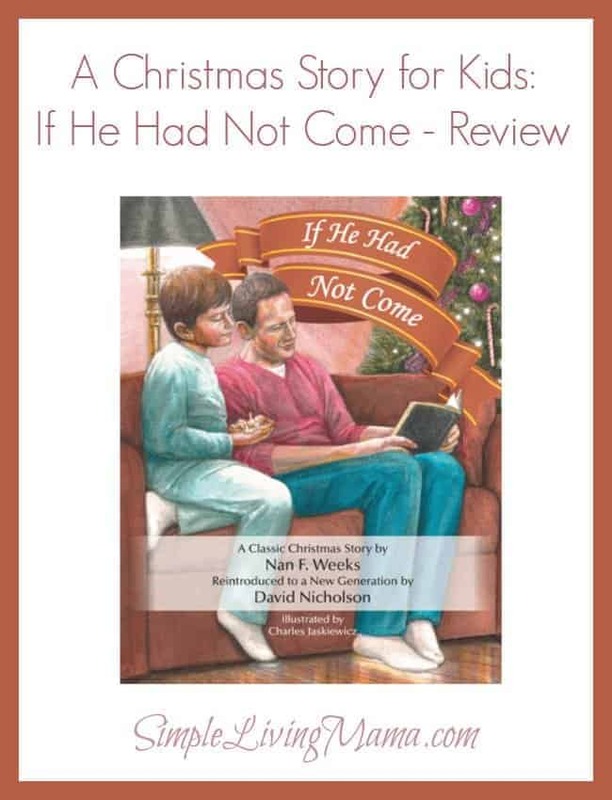 We recently had the chance to review If He Had Not Come by David Nicholson and we now have a new book to add to our Christmas collection! If He Had Not Come is a classic Christmas story originally written by Nan. F. Weeks. David Nicholson has retold this story for our children. Charlie Jaskiewicz does a spectacular job with the beautiful illustrations. The story follows a little boy, Bobby, on Christmas Eve and Christmas. Bobby’s father reads to him from the Bible on Christmas Eve. The words “If I had not come,” from John 15:22 stand out in Bobby’s mind and he goes to sleep whispering them. When he wakes on Christmas morning, Bobby learns what the world would look like if Jesus had not come. No one knows what Christmas is, there are no places around to help anyone, and the world is very bleak. Bobby eventually wakes in his room to find that he had dreamed the whole thing and it is indeed Christmas day. He vows to live his life pleasing the Lord. The last few pages of the book contain interactive topics for families and Sunday school teachers to discuss with children. There is also a section called “Going Deeper” that asks even more discussion questions and there is a page dedicated to the A-B-C’s of the Gospel Message. Finally there is a page with some suggestions to help you celebrate Christmas. This book is ideal for children ages 6 and up, but is lovely to read with the whole family. We received a beautiful hardback book that is 8.5×11 inches and contains 40 pages. We aren’t quite ready for Christmas just yet, so we read the story together and talked about a few of the questions in the back of the book. I do plan to read this story again around the Christmas tree with the kids when it’s closer to Christmas time. I am really looking forward to doing the activity in the back of the book because my children love to draw and I believe it will help reinforce the true meaning of Christmas. We loved this story. It’s a classic Christmas tale that we can read every year and I plan to do just that. The illustrations are lovely and the children just love to look at them. I really love the message in the story. In a world that is so focused on material things, we need more stories like this to remind our children what Christmas is really about. It’s not about the fancy toys under the tree, it’s about Jesus’ birth and the gift He has given us. I definitely love this story and recommend it to any family! You can purchase If He Had Not Come for $18.95 if you prefer a hardback, or $3.95 if you prefer an e-book.